This private studio is the only rental on our property. Olas Hermosas sits on a rare spot on the oceanside of the coastal highway, built with the remarkable view as the architectural focal point, and from every part of the efficiency you'll see the beautiful ocean, stunning beach and bay. Even when you take your shower you will be able to enjoy the view. Olas Hermosas is furnished with full kitchen, air conditioning, hot water, sunflower seed shower head, washer and dryer, speaker system that can be used with your iPod or other music is input devices and cable TV. A king-size bed converts to two twins, and for the third or forth person there is one double futon and/or a high end air bed with pump. Best suited for 1 or 2 people or a small family of four. It gets real close when there are four adults so not recommeded. All you need to bring are your personal items. The front has a private gated entrance. You do not need a four-wheel drive since you never have to leave pavement from the San Jose Airport to the gated entrance. 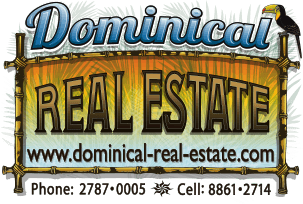 You will only be a mile from great shops and restaurants in the village of Dominical. The front yard area is fully landscaped using local tropical plants and flowers. The efficiency is perfect for a single person, couple or family with small children. We are located in a tropical paradise where the mountains meet the Pacific Ocean. The primary jungle ridge across the road is one of the steepest in the area so close to the ocean so no one is looking down on you. We have the best close-up views in the southern region. Ballena Marine National Park is only a 10 minute drive down the Coastal South Highway, with a gorgeous string of beaches along the way and two other National Parks close by. Do not to forget your binoculars and camera! From your top floor 180´ unobstructed ocean view terrace you can see a large variety of birds and wildlife throughout the day. Across the highway is an unobstructed few of the steep mountain ridge full of wildlife, perfect for sitting and seeing what you can spot from the covered patio or from poolside. Watch the activity of the local fishing boats from the small anchorage at bay side and see an occasional whale or two from your vacation rental getaway. Several were spotted from the veranda the week after Christmas just two-hundred meters offshore. Best viewing results are early in the morning and late afternoon. Get away from the crowds and stay in a private, clean and secure environment. It is not uncommon that you will find that you are the only one on this secluded mile-long picturesque beach just a 4 minute walk from your tropical home away from home to swim, sunbathe, stroll the beach or look for shells and sand dollars. Beach chairs for your comfort on the beach and a soft-sided cooler for your cold drinks and picnic treats are here for your convenience. We have two boogie boards you can rent for your entire visit for $10 each. Relax at the end of the day and watch as the sun sinks into the ocean most of the year. In addition to the regular gorgeous sunsets, you will experience the soothing sound of the rhythm of the ocean waves or, at other moments, witness dramatic scenes as huge waves encounter the rocks in a beautiful display of Nature at her best. A neighboring restaurant has one of the best secluded oceanview dinner locations that can't be missed. We are part of the Amancio neighborhood that settled the main property 50 years ago. * Tours, prices, descriptions, directions, times and telephone numbers. * Local restaurants and the night life. * Internet cafes (we have wireless), movie rentals, spa and beauty, shopping. * Taxis, buses, shuttles, gas, doctors, pharmacy, etc. Directions to Olas Hermosas will be sent prior to your departure complete with pictures along the route. * Horseback trips on the beach, to waterfalls or through the mountains. * Snorkeling or diving off Isla de Caños. * Hiking, bird watching, whale watching, biking, visits to tidal pools. * Local shopping, churches, boutiques, supermarkets, farmers market, restaurants. * Reptilandia, ultra light tours, ATV adventures, canopy tours. * Nights in the jungle @ Hacienda Baru´, Cinema in the Jungle. * River rafting, boating, sea and river kayaking, jet ski. * World class sport fishing,(reservations weeks in advance recommended) river fishing, mangrove tours. * World class surfing, surf lessons, boogie boarding, yoga. * Palates, weight lifting, tennis, rappelling, rock climbing. * Other tours in the area. We can help you with transportation from the airport, car rentals, and activities in the area, knowledge of best restaurants, our favorite local beaches or any other general information about the area. We are confident you will enjoy your time here and want to come back for more.